Peri-implantitis is not dissimilar to periodontal disease in that it has 2 phases; peri-implantitis which is similar to periodontitis and peri-implant mucositis which is similar to gingivitis. The difference between peri-implant mucositis and peri-implant gingivitis is the later has keratinized gingiva. Peri-implantitis is defined as infection with suppuration (pus) with progressing bone loss after the adaptive phase, in other words after the implant has healed into the bone. It starts with peri-implant mucositis, an inflammatory process of the soft and hard tissues surrounding an implant but no progressing bone loss. Peri-implantitis and mucositis are associated with loss of supporting bone, bleeding on probing/flossing, redness, and suppuration. Parafunctional habits (bruxism and malocclusion) and occlusal over-load. Excess cement and loose, over-contoured, or poor fitting crowns. Incomplete crown or abutment seating. Risk assessment for peri-implantitis on FOR and from playing around with it a little the biggest impacts are previous periodontal disease and and plaque. Surgical debridement with or without guided bone regeneration (GBR) for reparation of bony and soft-tissue defects. To date, studies suggest that nonsurgical treatment of peri-implantitis is unpredictable, and the use of chemical agents such as chlorhexidine has only limited effects on clinical and microbiological parameters. Adjunctive local or systemic antibiotics have shown to reduce bleeding on probing and probing depths in combination with mechanical debridement. 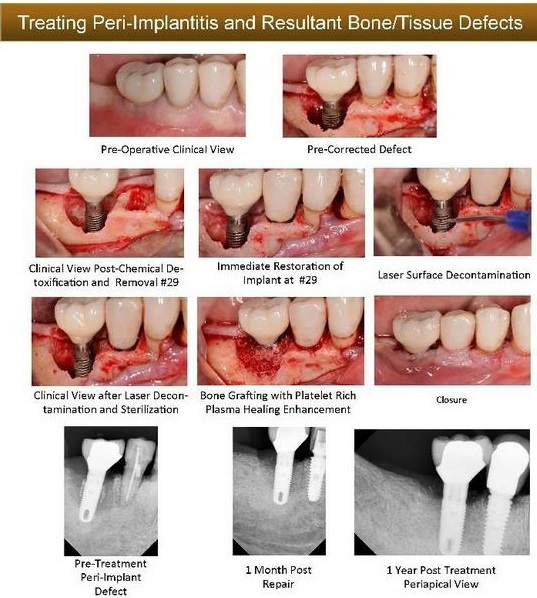 Beneficial effects of laser therapy on peri-implantitis have also been shown. Left untreated chronic peri-imlpantitis results in epithelial down-growth, bone resorption, soft tissue encapsulation and a hopeless implant. Double check bite to ensure tooth is not taking excessive biting force (malocclusion). Piezo debridement, EDTA and citric acid then CHX then sterile saline rinse, localized dual drug delivery with Arestin antibiotic, and prescription for chlorhexidine rinse for 10 days. Only do this an an adjunct or pre-treatment to step 4. This example appears to use diode laser? Believe better to use CO2 or Er:YAG. If you have any questions about wheaton implant care or service please feel free to email me or contact my office. If you live in the Wheaton/Glen Ellyn area we would be happy to see you for a complimentary evaluation to see if you are an implant candidate. Klinge B et al. A systematic review of the effect of anti-infective therapy in the treatment of peri-implantitis. J Clin Periodontol 2002; 29:213-220. Mombelli A, Lang NP. Antimicrobial treatment of peri-implant infections. Clin Oral Implants Res 1992; 3:162-168.Rosenberg ES et al. Microbial differences in two clinically distinct types of failures of osseointegrated implants. Clin Oral Implants Res 1991; 2:135-144. Schwarz F et al. (2006a). Nonsurgical treatment of moderate and advanced peri-implantitis lesions: a controlled clinical study. Clinical Oral Investigations 10, 279–288. Wadhwani C et al. A descriptive study of the radiographic density of implant restorative cements. J Prosthet Dent. May 2010; 103(5):295-303.